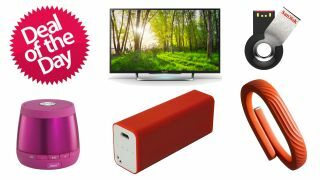 TechRadar Deals: Bargain TV, games, speakers, chargers and more! Each day TechRadar brings you great deals on tech products from around the web and today we've got some excellent bargains for you. Let's start today with some bargains on next-gen console games. Firstly, you can currently pick up the fantastic shooter Titanfall on Xbox One for just £19.85 at Amazon.co.uk - that's actually slightly cheaper than the Xbox 360 version. Meanwhile, inFAMOUS: Second Son can be had on PS4 now for just £21.39 at Amazon.co.uk and if you still haven't played the Tomb Raider reboot, now could be the time to pick up a copy. It's a brilliant game and now available for just £16.95. Smart TV: Today's first hot deal comes in the form of the brilliant 50-inch Sony KDL-50W829 smart TV. This was one of our absolute favourite TVs of 2014, and at the time represented the best value high-end TV out there. You can now get it even cheaper, it's down to £679 at Currys. Power bank: Need to charge your phone but don't have access to a socket? Carry a portable power pack in your bag. This 2800mAh one is tiny and convenient and costs just £16.92. Activity tracker: Want an activity tracker for keeping track of your exercise and sleep cycles? The Jawbone UP24 is one of the best gadgets out there and is currently available for just £77 at Amazon.co.uk - down from £124.99. Speakers: Want a portable battery-powered Bluetooth speaker for taking away with you at the weekend or just for sitting in your kitchen? This one is down to just £16 from £59.99. USB stick: Need a new USB stick to clip on to your keyring. This SanDisk model has 16GB capacity and costs just £4.14!